HomeGIS CareerWhat Can You Do With a GIS Degree? If you’re asking these types of questions about a GIS degree or alternatives, then you’ve come to the right place for answers. Because not only will you learn about career options for GIS graduates, but you’ll also find out about earning potential. It’s said that you don’t truly know your data until you can see it geographically. Because we can connect information to locations, Geographic Information Systems (GIS) is changing the way we do decision-making. First, the humble GIS technician creates geographic data. Second, the artistic cartographer displays it on a map. Next, the analytical GIS specialist and programmers analyze and automate. Finally, GIS managers coordinate projects and people. But there are tons more for potential career options with a GIS degree. For example, this table lists typical job titles for GIS degree graduates. As you can see, positions can range anything from entry-level to senior-level. Typical GIS Employers: Which Fields Can You Work In? Awhile back, I had a comment asking about which industries GIS integrates most with. If there was one industry you could complement with a GIS degree, which one would it be? As GIS is still a relatively new technology, there are thousands of GIS applications waiting to fuse into various industries. 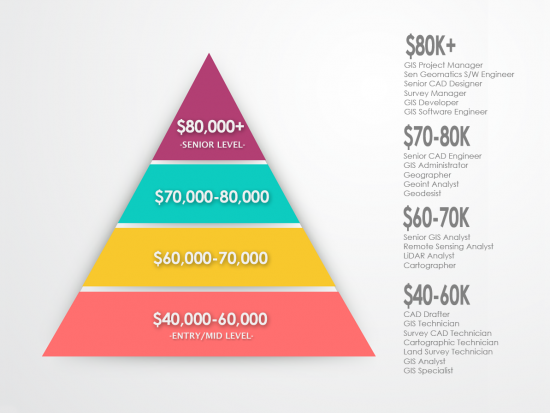 GIS Degree Salary: How Much Money Can You Make? Like most careers, positions can range from entry-level to senior. At the lower end of the pay scale, technicians and draftsmen typically earn the least. For these types of positions, skills include databases, CAD and mapping. As you move higher in pay scale, there are more specialized jobs. For example, remote sensing and LiDAR analysts are in the mid-range pay scale. 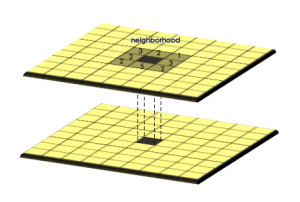 Also, we start to see GIS developers and programmers who create the GIS software that analysts and cartographers use. At the top of the pay scale, senior GIS positions dominate the salary list. For example, GIS project managers execute and close projects. Also, senior software engineers have the experience and education necessary to design, develop and maintain software. If you have a higher level of education and experience, you are more likely to be at the top of the pay scale and earn more. According to the US Bureau of Labor Statistics (BLS), geographers earn an average of $74,260 annually. Currently, the outlook is at 6% but the outlook changes often. On the other hand, cartographers and photogrammetrists earn an average $62,750 per year with a job outlook to grow 19% from 2016-2026. Overall, this is much faster than the average rate of growth. 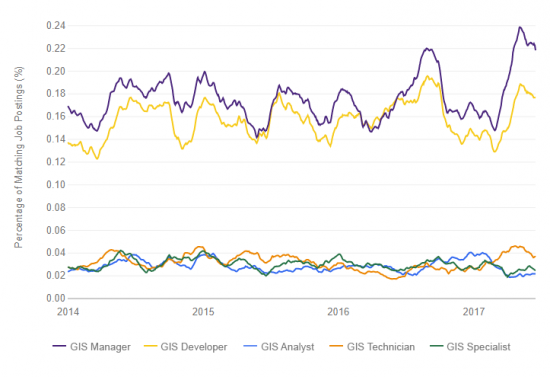 According to Indeed, GIS developers and managers account for the highest percentage of job postings. In this line chart, GIS has been steady for job prospects. Even though, GIS technicians, specialists and analysts have the lowest number of available jobs, these job roles often overlap. If you added up their job postings, it would be similar to GIS managers and developers. If you want to earn a GIS degree, the American Association of Geographers (AAG) Guide to Geography Programs lists undergraduate and graduate geography programs in the United States, Canada, and Latin America. Furthermore, it includes degree requirements, curricula, faculty qualifications and program specialties. From my experience, some of the best GIS programs are University of Penn State, Ohio State, Chicago and Arizona. If you don’t want to go “all in” with a GIS degree, the alternatives are a GIS diploma or GIS certification. Alternatively, there are online GIS certificate programs. And these are fairly good optiosn because you can compliment another expertise such as in engineering, environment or soils. Because GIS certification can help differentiate you from the crowd, it can also give the extra credentials you need. Geographic Information Systems Professional (GISP) requires at least 4 years of full-time experience in GIS, contributions to the GIS community and to pass the GISCI Geospatial Core Technical Knowledge Exam. Esri Technical Certification (Desktop, Developer and Enterprise) is completely knowledge-focused and exam-based. Both certification programs expect a level of proficiency in GIS and test your skill level. No matter what you choose (GIS degree, GIS diploma or GIS certification), it depends on your current level of proficiency and what you want to get out of it.